In the ongoing quest for sounds from the hearts of space for use as digital music sources, I give you NASA’s SuitSat. 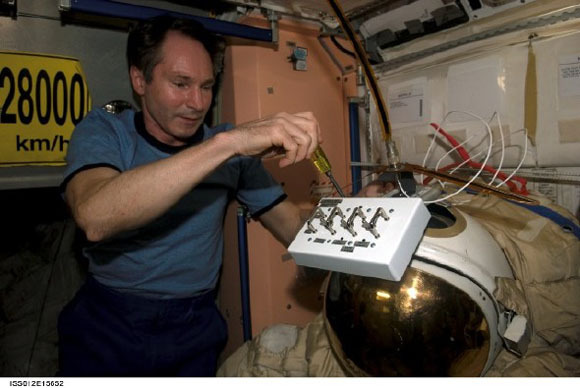 The crew of the International Space Station has equipped the Russian Orlan spacesuit with batteries, a radio transmitter, and sensors; it’ll transmit power and temperature info Earthward. To pick it up, you just need a radio receiver that can be tuned to 145.990 MHz FM. February 3 is the launch, with tracking info posted to the SuitSat Tracking site. Now this sounds like a sound source even more interesting than the dying hard drive. (More on the results of the latter from Gizmodo.com soon.) Anyone got a good FM receiver to pick this up? Let me know! If we can get some audio, we can start the remixes. Disembodied space suit tumbling to Earth? There’s probably a whole concept album here.